This hardware is used to keep a computer monitor awake when there is motion in the room. The monitor displays important information for firefighter in the vehicle bay, but only needs to be on when they are getting ready to go out on a call. 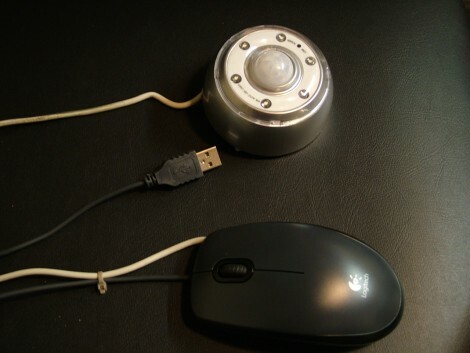 The solution is a simple one, a PIR sensor combines with a mouse for motion sensitive input. When the PIR sensor detects motion it causes a mouse button click via a 2N3904 transistor. Now the monitor will not waste power or have burn-in over the long term, but whenever someone is in the room it will be displaying the information that the emergency workers need to know. I assume the mouse isn’t used to interact with the user interface. Otherwise everyone would have to stay perfectly still to avoid clicking randomly everywhere. Its hooked to the middle mouse button, and there is a switch on the PIR sensor for regular use of the mouse. Nice hack and an elegant solution, i like it. that’s a freaking cool hack! Very interesting hack…great for power saving, but I thought LCDs don’t have burn in? That is interesting and very clever. I wonder, though, if it wouldn’t be a much better idea to have the trigger be a slight one or two pixel move of the mouse rather than a middle click. Something that would move a few pixels one direction ( just over the threshold tricking the computer to stay awake ) and then right back to where it was. That would keep the screen awake and not middle-click anything. In this case I see that it doesn’t seem to matter if the middle mouse button is clicked, but in other applications it might. For personal use it would probably be a good idea to normalize the connection so when someone actually touches the mouse it would disable the need for the keep alive trigger and then when the mouse is let go again the PIR sensor kicks back in. It’s probably a large size plasma display or something. I am not too sure about LCD burn in…. a couple of years ago my XP laptop suffered burn in (image persistence) with the task bar and clock. ummh.. it’s a bit too dirty I think. Why don’t connect it as a mouse or keyboard and press a button/move a pixel when someone is there. 5 minutes timer after someone moved, and noone could notice a 1 pixel mouse move every 5 minutes. As far as I know,even a press of the Strg, Alt or Shift key is enough to wake up the monitor. Combine the switching of the PIR with the relay from the emergency lighting project a couple of entries above and just switch the monitor power on when there is motion.